We Drink Beer. Everyday: February 10th: Trevor imbibes an "Ode to a Russian Shipwright"
February 10th: Trevor imbibes an "Ode to a Russian Shipwright"
You know what get's taken for granted sometimes? Hops. I know, crazy. Believe it or not, there was a time when beer was brewed without any hops at all. 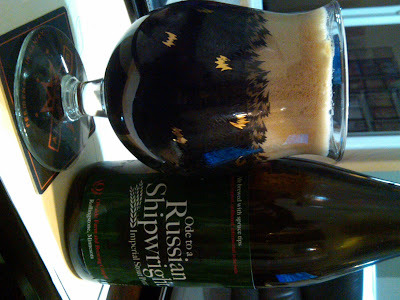 While that sinks in, I'll pour a hefty glass of today's offering, Olvade Farm's "Ode to a Russian Shipwright", an Imperial Stout Porter brewed with rye and spruce tips as a tribute to Peter the Great. As a beer geek, I always appreciate a brewer who goes out and makes something truly unique. Olvade states on their website "We aim to craft fine ales that honor ancient brewing tradition and culture", and boy howdy, they do one hell of a job. The "brewery" is literally one guy who grows his own barley, brews, and bottles the beers at his farm. This one uses hand picked spruce tips as an homage to early brewers who used them instead of hops as a bittering agent and preservative in their beer. The beer pours a dark brown (not quite black), with a fluffy white head that has no intentions of going anywhere. The nose is vastly different from any RIS I've ever had. Dominated by spruce and hops, the smell is layered with roasted malt and dark fruit, with just a touch of chocolate underneath. The taste, like the smell, is a departure from convention, as the rye malt sets a less imposing stage for the roasted malt and spruce to make a name for themselves in the middle of a happy, chocolate sugarplum oasis. The mouthfeel is...wait for it...not like a RIS. More carbonated, and less ponderous than many of this style. It's something I appreciate. Like any beer from Olvade, this is an adventure and a history lesson all at once. I have a feeling this would be a great beer to cellar, as the spruce will likely fade away and allow the other flavors to come forward.